Pink Sapphire And Diamond Ring Set in 14k White Gold ( 0.35ct PS) See Specifications f.. Pink Sapphire And Diamond Ring made in 14k White Gold (1.6ct Ps) See Specifications for more details. ..
MARQUISE SHAPE PINK SAPPHIRE AND PAVE' DIAMOND RING( 1.33ct PS) A rich complement, this spink sapphire and diamond ring features a sparkl.. Pink Sapphire And Diamond Ring made in 14k White Gold ( 0.6ct PS) See Specifications for more details. SH.. Pink Sapphire And Diamond Ring Set in 14k White Gold ( 1.15ct PS) Everest 14ct White Gold Pink Sapphire And Diamond Ring Split Sh.. Pink Sapphire And Diamond Ring in 14k White Gold (0.60 ct Ps) See Specifications for more details. SHIPPING DETAIL.. 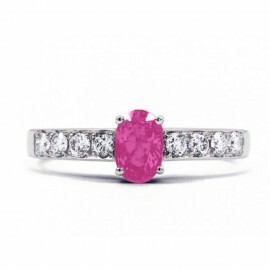 Pink Sapphire And Diamond Ring made in 14ct White Gold ( 0.28ct Ps) See Specifications for more de.. Pink Sapphire And Diamond Ring Set in White Gold ( 0.75ct Ps) See Specifications for more details. .. Pink Sapphire And Diamond Ring Set in White Gold ( 1ct Ps) See Specifications for more details. SHIP.. Pink Sapphire and Pavè Diamond ring made in 14k White Gold (0.83ct Ps) A sparkling balance, this gemstone and diamond ring features an oval pi.. PINK SAPPHIRE OVAL SHAPE AND DIAMOND RING (1.04 ct PS) Accessorise beautifully with this eye-catching oval cut pink sapphire gemston.. The Bold Pink Sapphire And Diamond Ring Made in 18k White Gold (0.98cts Ps) Pink sapphire oval cut with daimonds in white g.. Slender bands of 18ct rose gold and rows of brilliant diamonds interlock to lend this beautiful cuff bracelet a feminine yet striking presence. Slender bands of 18ct rose gold and rows of brilliant diamonds interlock to lend this beautiful cuff bracelet a feminine yet striking presence. S.. This sophisticated 18ct rose gold bangle is pavé set with a full circle of sparkling round brilliant cut diamonds for a timeless, elegant look. This sophisticated 18ct rose gold bangle is pavé set with a full circle of sparkling round brilliant cut diamonds for a timeless, elegant look.See Specific..